SAM ( security accounts management ) which stores the encrypted hashed copies of our passwords. These crypted passwords and user information are stored in file named sam in system 32\config folder. It is not easily accessible. 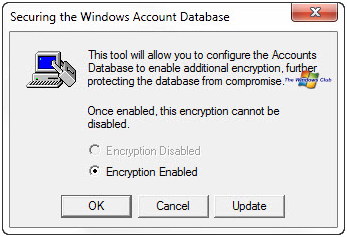 If you want to additional security to sam file, you can syskey an inbuilt key to add additional security to sam file. In update password section, you can set a strong password to open access that file. In system generated password, If you choose to Store Startup Key Locally, it will store a key as a part of the operating system and no interaction is required from the user during system startup. 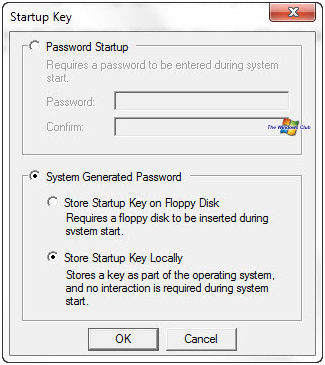 Or if you choose store startup key on floppy disk, you will be asked to insert the floppy disk or USB disk, the startup key will stored on that disk. So whenever you want to access the sam file, you will be asked to insert that floppy disk or USB stick you have stored the syskey. If to disable the syskey, reverse the above process and choose store startup key locally. Hard disk messing with you by showing full even though it is not! 0 Responses to "To lock your computer using USB stick by inbuilt Syskey"